We live in the Do-It-Yourself era. You can do nearly anything on your own from home and car repairs to education and investing. Some things turn out wonderfully as DIY projects, but other things may not perform optimally with the DIY approach. A home security system is one of those things where a DIY setup may not be as secure as a professionally designed and monitored system. Some kits may come with more, some may come with less. But most offer just the basics. It is then up to you to decide where to place the sensors, where to put the alarm, where to put the keypad, if they are all installed securely and where they will operate optimally. Most people without a background in security will just be guessing about all of this. Then there is the matter of what will happen if a break in does actually occur. Most systems will inform you that something is amiss if you have installed everything correctly, but then you have to decide next what to do about it. You will be the one to notify police if someone is breaching your home. Also, does the company repair any broken equipment? How much will upgrades cost? Will you need to buy extra or more equipment if you move? These are costs that you need to consider when you choose to DIY your home security system. Before you decide to buy a DIY kit, consider a home security system from a security company in your local area. We use top of the line products to secure your home with advanced features that can detect if it’s a pet setting of the sensors or something sinister. We can integrate some pretty amazing services into the security services as well, such as freeze protection and flood and moisture detection. You can also add thermostats to the system, which can automatically adjust temperatures when your system is armed…you could end up saving money on your power bills! We have security cameras for both indoors and outdoors, and home automation so you can turn on your home lights when you want and then turn them off remotely. 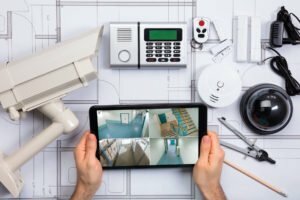 At 4Sight Security our team of professionals include electronics and installation professionals who know all of the ideal places for sensors as well as how to install them for maximum results. We have technicians who can come to you in the event there is any malfunctioning equipment, we are a phone call away. You don’t have to wait for a replacement to be sent to you in the mail. Just having real people available to show you exactly how to operate your system is priceless. And being able to update your equipment or add extra measure to it is a bonus of choosing a local security company as opposed to winging it on your own with a DIY home security system. We are as concerned about your home and business security as you are and customer service and satisfaction are our priorities. We provide service to many local businesses and municipal services as well. We believe we are a better security choice for your home or business than a DIY home security system and we would love for you to give us a call and tell you everything you want to know!